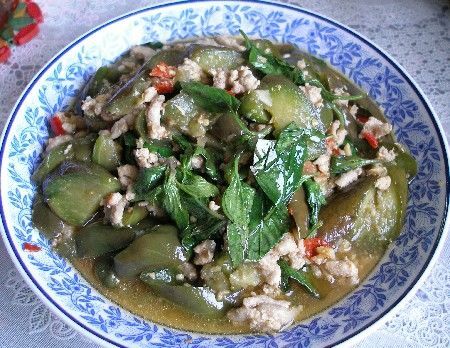 Stir fried eggplant with fermented soybean and minced pork (Ma-keua Yaao Pad Tao Jieow Moo Sap) is one of the rice side dishes that is popular for many Thai people to eat. Because the ingredients are easy to find, it is simple to make and it still tastes delicious. Thai Eggplant is commonly known as white eggplant. Even so, you will find that there are so many colors of eggplant including light green, dark purple, white, or dark purple mixed with white, etc. Eggplant has a lot of nutrition. Thai people often use it to make many dishes such as eggplant salad (Yum Ma-keua Yaao), pound eggplant (Tum Ma-keua), etc. 1. Rinse the basil and the eggplants with water thoroughly. Drain the basil and pluck the leaves to set aside. Cut off the eggplants ends. Then chop the eggplants into an oblique shape about 1.5-2 inches thick (or cut in half lengthwise first and then slice crosswise into about 1 inch sized pieces each). Soak the sliced eggplant in water. Add a slight pinch of salt into it, this will help the eggplants from turning dark. 2. Pound Thai fresh chili and garlic together just enough to be coarse, set aside. 3. Set the pan on medium heat. Add vegetable oil into the pan. When the pan is hot, put the pounded garlic and chili to fry until fragrant and then add the minced pork to fry until it is done. Then add the soaked eggplants into it (drain before putting it in). 4. Season with fermented soybean, soy sauce, fish sauce and sugar. Add ¼ cup water, stir the ingredients well together. Then put the lid on to cover the pan. Wait for the eggplants to cook for about 4-5 minutes and then open the lid. Stir again. Last, add the basil leaves. Fry until the basil leaves get soft. Turn off the heat, lift the pan off the heat and put the stir fry on the plate. (To stir fried the eggplant like this some places like to cook the sliced eggplants in hot water about 2-3 minutes prior to frying. When it is time to fry this will make the eggplants soft and cook quickly).